they did the song from beautiful life, wOW it was soo good live. some people travelled from japan to follow B'z around on their american concert tour!!! those fanatics were there waiting in line at 3 am!!! i came at 4pm, waited 3 hours to get in. i really like B'z! lucky you! wish i was there! did ya manage to snap any picz! omigod!!! i am so green with envy? any pix u can paste here? yah their concert was subarashikatta!!! i was SOOOOO close to inaba san!!! like 10-15 feet away. i wished he would have ripped off his sweaty shirt and throw it to the crowd, but he only put water in his mouth and spat at the crowd! (also he threw the cups at us too..
the concert was called Banzai in NOrth america!!! they also visited las vegas, los angeles, and seattle. they were here in San francisco for 2 days. i bought a t shirt as sourvineer. wished i couldve met some jdorama fans there, although there were a lot of japanese, there were many americans as well! now i'm really, really green with envy. u lucky devil! too bad about the camera though. i wish B'z would come here... i so love their songs. he has just the sexiest voice!!! my friend and i were standing right in the middle about 10 feet away (second or third row). Bad thing about it was there were 2 japanese guys who were crazy and taller than us. they were pushing and crushing us like crazy!!! that was the only thing bad that happened..
B'z is also heading to Vancouver Canada to end off their tour. so any canadians out there, should gO!!! Aww...u lucky ducky!!! Wishin' i was there! wow its soooo cool that ya got to go....i was gonna go to the ones here in LA ..but they were on a tue. and wed......so i had to work!! dreams come true, puffy (in LA only), B'z, and amuro namie (in hawaii only). wish amuro namie would come to california, especially to SF! LOL... i wish le arc en ciel, JAPANX, the seatbelts and, the pillows...would come to America... but it'll never happen... still that would be cool.... well i can dream can't I? It is very nice.. also the video is cute! Anyway hehe u are lucky,i never see a j-concert in my life I wish that i have had the luck to go and see an x-japan concert sigh..
if laruku is going there!, I'm definitely flying over to the states..
concer ticket in jpn is way tooooooo eX! 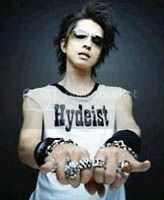 hyde's concert ticket cost bout USD$210...that's app RM800 here!!! Ehi Juliana,sorry to ask,but hide in your pic and the hide u mention,who is? The only hide i know was the hide from X-Japan dead.. sigh sob.